Dermaflage for sale in Malaysia. Normal makeup powder cannot cover the sunken scar on skin. Now we have Dermaflage which is liquid powder or gel plastic to cover the sunken scar on your face. Now we can cover our ugly sunken scars in just 2 minutes! 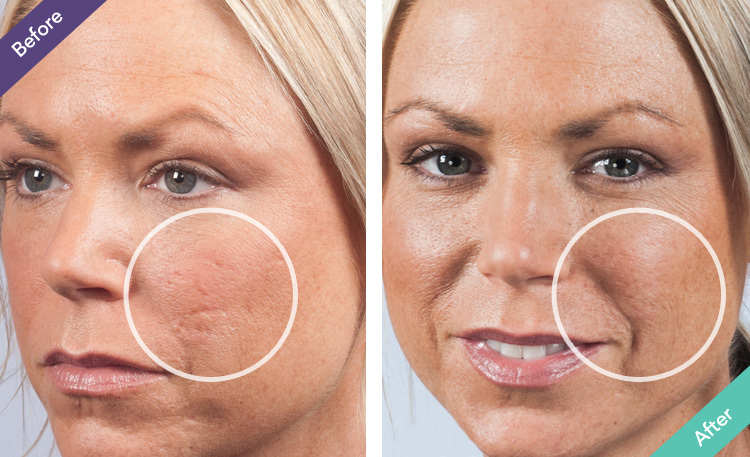 Dermaflage perfects little imperfections and larger scars, providing a cosmetic option for recessed scars on the face and body. 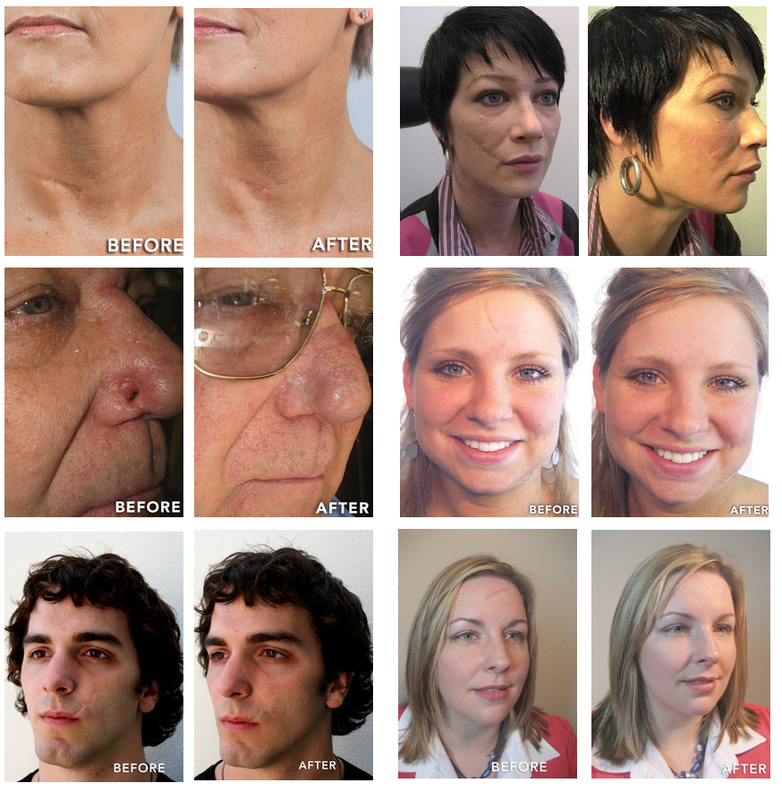 Now, you can conceal scars without surgery and without painful injections or chemicals. Dermaflage is the first topical dermal filler on the market. This innovative product bridges the gap between plastic surgery and make-up. Dermaflage was invented by a former Hollywood make-up artist and world-renowned facial prosthetic specialist Matt Singer, who has has more than 15 years of experience working on countless films and television shows. Dermaflage is the answer to plastic surgeon, dermatologist, and consumer requests for a scar concealment product that works better than traditional cosmetics. Singer began to offer a new topical scar filler that worked better than any makeup product on the market. 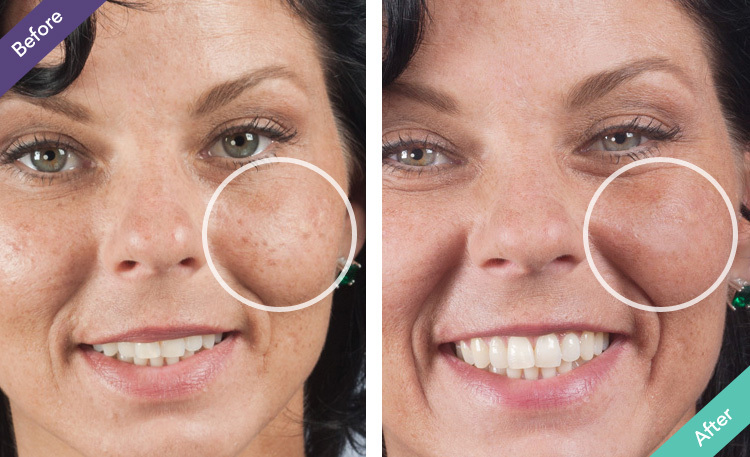 Dermaflage simplifies the application process into three easy steps that can be performed by any consumer. Brennan has struggled with acne scarring for years. She attepted microdermabrasion and lasers with little success. Finally, Dermaflage has given her opportunity for smooth skin she's been looking for. She said : The scars on my left cheek are the result of severe cystic acne. Dermaflage is the ONLY thing I have found that is able to conceal my scars and lessen their appearance. It has returned my confidence and self-esteem. I absulutely love and wear by it. I have been using it for over a year. Remember watch the amazing transformation on you-tube! Brush Primer over the areas you wish to conceal. Let it dry for 30 seconds. Twist new mixing tip onto the Dermaflage Applicator and squeeze the silicone blend into the scar. With a finger or spatula tool, blend the edges into the skin. The silicone blend will start to set immediately, so make sure you smooth the product on to your skin quickly. Use smooth, even strokes; do not dab. Place Skin Texture Pad over the Dermaflage blend. Gently press around the edges of the scar. Hold the pad in place for at least 1 minute while the product sets. Lift pad from edge. Dermaflage will harden fully after five minutes.That’s it. Now, may the rest of your day be as perfect as your skin. 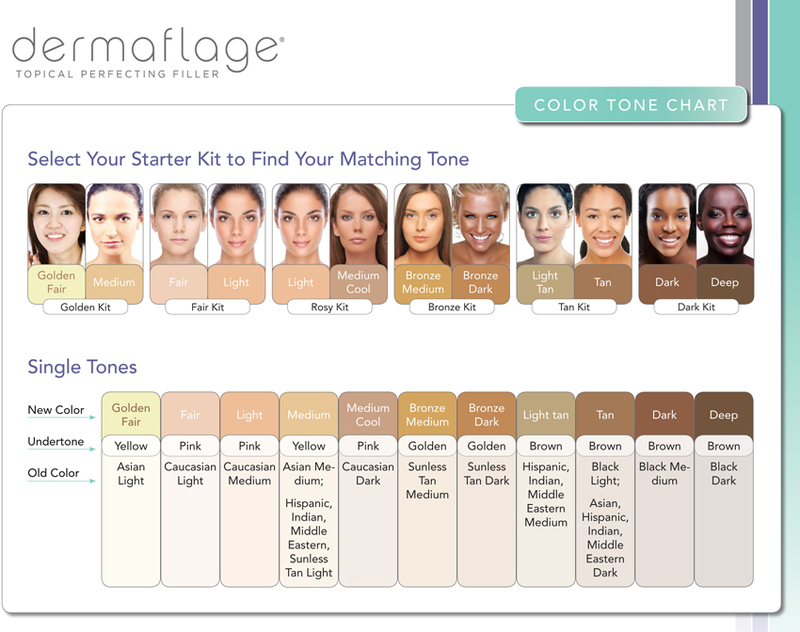 1) Matching Your Skin Tone: A starter kit contains three different skin tones. Choose the one that is closest to the color of your skin. If you are between colors, choose the darker of the two. 2) Cover One Area at a Time: Don’t try to cover too much at once. After the silicone blend has been squeezed out of the applicator, it begins to change from a liquid to a firm consistency. 3) Smoothing the Silicone Blend: Once you apply the silicone, you have about 30 seconds to use your finger to gently smooth the material into the scar and onto the skin on both sides before placing the pad. 4) Do Not Dab: Use smooth, even strokes. If done correctly, the transition between skin and silicone should be imperceptible. 5) Do Not Press Too Hard on the Pad: Pressing too hard will cause you to push the filler out of the scar before it sets. 6) Wait for the Silicone Blend to Set: Dermaflage typically sets in two minutes. Make sure you time yourself. 1) What If the Filler is Not Flush With My Skin? Use less product than you think you’ll need. Using too much silicone will make the material appear to stick out from the skin rather than filling the scar or defect. You can always do a second application. No need to add more primer when you do another pass. 2) How Do I Know When the Silicone Has Set? Leave a little bit of product on the end of the tip when you finish applying it to your skin. After two minutes, touch the residual material on the end of the mixing tip to see if it feels like solid rubber before slowly removing the pad from your skin. 3) What If It Is Peeling Off? Make sure you fully cover the area around your scar with the primer. This is what makes it stick. 4) What If the Pad is Too Big? Cut it! You can cut the pad into whatever shape works best for you. 5) What If It Hardens Too Fast? To give yourself more work time with the material, place the applicator in the refrigerator for five minutes. Colder temperatures will give you more time to spread the material, while warmer temperatures will make the silicone set faster. 6) My Applicator Won’t Work. Make sure you use a new application tip each time. The tips will not work more than once. Throw the applicator tip away each time you are finished applying the product. The silicone blend will not set until it combines in the applicator tip. 7) How Do I Prevent Shine? Always place the texture side of the pad against the skin. The texture is what imparts the realistic surface quality and eliminates shine. 8) What do I do if I have a large area to cover? Don’t try to cover too much at once. You will get better results if you work on one area at a time. After the silicone blend has been squeezed out of the applicator, it begins to change from a liquid to a firm consistency. 9) What’s the best way to blend the silicone? It is important to smooth the edges with broad strokes to blend flush with your skin- do not poke or dab. If it doesn't look good before you add the pad, it’s not going to going to be perfect after you remove the pad. 10) Can I wear make-up under or over the Dermaflage? What do I do if my scar has discoloration? Make sure you put your make-up on as you normally would, before applying Dermaflage. Part of the secret to the natural appearance of Dermaflage is its translucent properties- if you put make-up over it, the effect is ruined. Only use translucent powder (like Bare Minerals) over Dermaflage, so that the light can still get through. Here's a comment from a customer on our Facebook page: Don't use make-up on top of it! The product is translucent. Put your makeup on first. You might have to remove a little where u are applying the material, but the point is, makeup doesn't look good on top of the product. This is your last step! 11) Why is the primer turning yellow on my skin? The primer can discolor your skin if you apply a moisturizer before Dermaflage application. It is important to keep the area of the skin you are interested in covering clean and free of any lotions. Simply remove the primer with rubbing alcohol and clean your skin before reapplication. 12) How hard do I push the pad? Not hard! Pressing too hard will cause you to push the filler out of the scar before it sets. The key is to just hold the pad lightly and tap around the area you are covering so that the texture is imprinted. 13) How do I store Dermaflage between uses? Keep Dermaflage at room temperature, if it gets too warm it will speed up your work time, if it gets too cold it will slow it down. When you are not using a syringe, keep a tip on the top on so it won't dry out. Tips: the mixing tips can only be used once because the Dermaflage hardens. However, some of our customers don't use mixing tips- it is really a personal preference. Here is a comment from a customer on Facebook: Just use the small amount you need and put the cap back on to use the rest later. You can either use the mixing tips, or mix it on a piece of aluminum foil like i do and apply it with a small tool like a toothpick or broken off wooden Q-tip for small scars. Make sure you blend the edges with your fingers before immediately applying the pad for 2 minutes. I don't waste any material and a syringe lasts me more than a month. 14) Why is only one side of the applicator tinted? First it is important to understand that Dermaflage is a two part silicone. Two equal parts of Side A and Side B must mix together before the silicone will harden and form a solid. You cannot conceal your scar with just one side of the applicator. The silicone will never harden or complete the scientific reaction that requires equal parts of both sides. Next, here at Silicone Arts Labs we have found that only tinting one side allows our customers natural undertones to shine through. You aren't opaquing out your skin tone, simply leveling the plane of your face for a flawless smooth complexion. 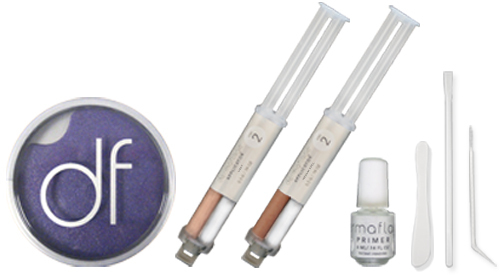 RM198 per set (2 x Applicators, 2 x Mixing tips, Primer with Brush, Mixing stick, spatula, Texture Pad, plate).